I sat in the airport boarding area hyperventilating. My father looked over at me from his seat, more annoyed than concerned. He knew that I didn’t want to travel, yet he made it clear that I, being 14 years old, had no choice in the matter. We were going to visit my grandparents in Puerto Rico. They hadn’t seen me in years and had been asking for a visit for some time. I was told it would be a time to reconnect with my dad’s side of the family and enjoy the country air and the beaches. Oh, and there was this one other thing. I wasn’t supposed to let anyone know that my mother had died a year and a half ago. You see, my father hadn’t found the right way to tell them that their ex-daughter-in-law had succumbed to cancer after a two-year battle with lymphoma. In fact, they never even knew she was sick. The weight of traveling with my father and being forced to keep this secret suddenly became too much to bear. I couldn’t feel my face. My breathing became more labored. I took the money and walked toward the small store in the waiting area, fully expecting to return with a bag of Combos, into which I would drown my pre-flight sorrows—that is if I could actually make it back without passing out in full view of every American Airlines traveler in Newark Airport. But salty snacks and/or fainting were not to be, because at the entrance of the store stood a circular magazine rack. You know, the kind that you could spin until you found the perfect guilty pleasure reading material? This one, though, was filled with comic books. I had never owned a comic before, but there was something about the one particular book that stared back at me from the rack. 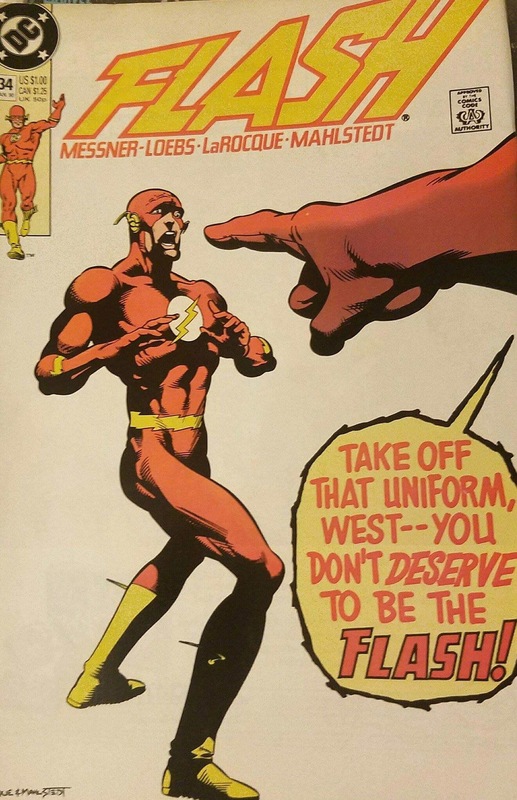 Flash #30, “Shot In The Dark,” it read below a closeup image of the Scarlet Speedster. A gunsight was trained on his forehead. He looked confused. At least to me he did. The parallel to my current situation was lost on me at the time, but in that moment, all I knew was that I wanted to read this story. The heavy breathing slowed a bit as I paid for the comic and returned to my seat. In the course of a week, I must’ve read that issue 50 times. I didn’t know it then, but I had inadvertently stumbled upon a means to control the anxiety that had been and continues to be the Joker to my Batman, the Red Skull to my Captain America, the—well, you get the idea… My arch nemesis. Years later, and after much therapy, I learned that I had been collecting things as a defense mechanism almost my whole life. It certainly didn’t begin with comic books. When my dad would tie one on and come home angry and looking for a way to vent his rage, I’d retreat to my collection of Star Wars action figures. Later still, when my parents were divorcing, well, I could rearrange my Garbage Pail Kids collection. My therapist was kind enough to inform me that Freud had theorized that the urge to “collect” manifested itself during toilet training. Yes, that magic moment when a child becomes so traumatized that a part of him was being flushed down the drain that he subconsciously compensates later in life by holding onto “things” that he deems important. Ew. I’m not necessarily convinced that my fixation with collecting started on the bowl. No, I would eventually come to realize that this was, in fact, a way to control some small part of my world while the rest of it spun out of control. Collecting something, anything, gave me a measure of power. I could categorize, number, store and monitor my collections. In those tiny micro-universes, I was in charge. Dad finishing up another six-pack? Let’s make sure that I have the action figures arranged by size! It makes a lot of sense, almost 30 years removed. But those collections, no matter what they were, never endured. Eventually, I’d lose interest. Maybe as things would begin to get better, I’d realize I didn’t “need” them. Then, things would begin to slide. There was no bigger slide than that day in January 1988 when I lost my mom. There I was, without her and without a collection to which to retreat. 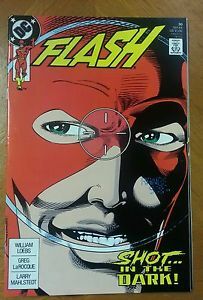 That was until Flash #30. Up until that point, the moments of uncontrolled, breathless fear and confusion were becoming all too frequent. I’d lock myself away, utterly confused by the idea that I could be living in a world without the woman who brought me into it. It made no sense, and the world spun wildly on its axis. I needed control if I was going to survive. Comics brought me that and, somewhat surprisingly, they have endured as a means of helping me maintain that control to this very day. But what makes comic collecting any different? Why is it that this hobby has had the most profound and lasting effect on my ability to help control my anxiety? Sure, comics, like almost every other collection, require careful organization. In that sense, they are almost identical to anything else I’ve collected. Bag them, board them, make sure that they are properly stored in an area that’s not too hot or not too cold. If history is a guide, my fascination with comic collecting should’ve gone the way of every other collection I’d ever attempted. Yet, it didn’t. And I think I know why. It’s the story. I didn’t just read that copy of Flash #30 fifty times to distract myself from the pain that my father forced me to endure on that trip. Sure, that was part of it, but the story of a young Wally West, who had graduated from sidekick status to inherit the mantle of the Flash after his parental figure, Barry Allen, had suddenly died, resonated with me. Like Wally, there I was, alone in the world, figuring out my place, my “powers,” if you will. As “Kid Flash,” Wally was careful about hiding his identity, but after he was left with the weight of continuing his mentor’s legacy, he was laid completely bare—one of the few characters in the history of comics to forego a secret identity. The world knew who he was, and because of that, he was never safe. There was nowhere to hide. He was a moving target. People expected so much of him and judged him harshly, even as he tried to find his bearings. He was young and not used to this new life and everything that came with it. If I could move at supersonic speed, it would be like looking in a mirror. This story, and so many others in the world of comics, unfolds over months, years, and even decades. These comics are filled with rich, complex plots featuring individuals who, despite their extraordinary abilities or skill, face extreme hardship and yet still persevere and succeed. The characters and their worlds are a larger than life reflection of our own, a modern day mythology with all the highs and lows of everyday life. Just cooler than everyday life. Make no mistake, regardless of their heroic stature, Bruce Wayne, Peter Parker, and even the big blue Boy Scout, Clark Kent (that’s Batman, Spiderman, and Superman for you non-geek types), are extraordinarily flawed individuals. They are us. They are me. When I become that boy again, sitting in the airport waiting area (and yes, it happens more times than I’d like to admit), I can take the most recent issues in my collection or even the most vintage, open them and remind myself that this flawed, scared kid can overcome whatever fresh hell awaits. The heavy breathing begins to slow down, I start to feel my face again and sometimes, I even board the plane. Up, up and away.